I have read this book before when I was around 12 or 13 and remember really enjoying it, however now, several years later I have completely forgotten the plot and the reasons why I liked it. So I decided to reread it. And now I know exactly why I liked it so much before! What I found most interesting was the topic choice since this is very creative yet unusual and isn't something I've seen covered before. I really liked this and felt that the themes included, such as family and friendship and courage, were wonderful (especially since it's mainly aimed at a younger audience). Gaiman illustrated these messages clearly but without being condescending to the readers which is important. Since Gaiman is well known for his gothic twists on fantasy worlds, I was pleased to see this included here. From the first chapter to the very end there was a very intriguing mystery that was gripping and dispersed throughout. The ending was really well written even if it was a little sad. Linking to this, I loved the illustration by Chris Riddell. They were quite creepy but also had a cartoon nature about them which I felt really fit with the style of the novel. These were another unique and creative touch to the novel that worked so well in connecting everything. The characters were my favourite part of the novel as I felt that they brought the most to it. The protagonist was portrayed in such a realistic way despite the surreal nature of the novel, and it was lovely to see his life from birth until the end of adolescence. I felt like the character development was really important and well crafted. As for the ghosts, I found them humerous and instantly likeable, especially favouring how they were all from different time periods and had such different/diverse things to offer to the story! 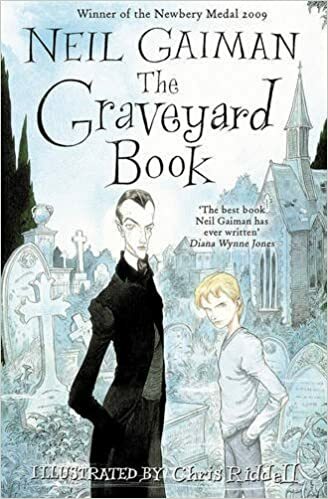 Overall this is another fantastic book by Gaiman and I enjoyed every part of it. I definitely recommend it if you're a younger reader but even if you're older it's still gripping and comedic. I can certainly see why I liked it so much when I was younger, and will be picking up more of Gaiman's books in the future!